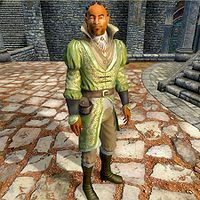 Orinthal is a Redguard assassin living in Bliss, New Sheoth. He is manically obsessed with facts, calculations and statistics and is often seen sharing his many pointless observations with his fellow townsfolk. He lives door-to-door with mood-swinging juggler Thaedil in the southwestern corner of Bliss. He sleeps in the upstairs area of his house every night between midnight and 8am and always starts the day with a two-hour breakfast. At 10am, he heads outside and strolls around the plaza and alleyways near The Missing Pauldron. At 2pm, he heads south and enters Books of Bliss for a bit of browsing and a chat with the proprietor Sontaire. At 5pm, he enters the Sacellum Arden-Sul for three hours of praying. He heads back home at 8pm and wanders around for a couple of hours before he eats a late dinner at 10pm. Orinthal is one of only two people who wear light green regalia, the other being Sontaire. He only carries his house key and a small amount of gold. Always preoccupied thinking about facts and numbers, getting near him will cause him to confusingly say: "Hmm, what? Oh, hello." When you talk to him for the first time, he will say "Orinthal, retired Assassin. Now I live here. Only Redguard here, incidentally. An interesting fact, isn't it? I do enjoy facts." On subsequent meetings he will use one of three other possible greetings: "Hello again. You don't happen to recall how many steps you took in getting here, do you? I was just wondering", "Greetings. Did you know that I slept for exactly 237 minutes last night? I find that fascinating" or "Hello there. Have I mentioned that my left arm is actually one inch longer than my right? Never know when that might be important." He will finish conversations with a confused: "Yes, yes. Goodbye." After the Main Quest, approaching him as Sheogorath will get his attention much quicker: "Hail, My Lord." Talking to him will net you: "So many figures to compile. Would that I had your infinite wisdom, Lord." After the talk he will return to his thoughts with: "Farewell, My Lord." Should he die, Orinthal's tombstone in the New Sheoth Graveyard reads: Numbers matter no more, for Orinthal has found eternity. "Another adventurer is trying to get into the Shivering Isles. If it's a Breton, it'll be the first one in 3.7 years." "Did you know that the Gatekeeper had only a three percent chance of failing? Most interesting that he was defeated." "I can't help but wonder what the percentage chance of the Resonator attracting a particular individual is. Riveting stuff, really." "With his Chalice returned, Thadon seems to smile at least four times as often. That's just an estimation, of course." "It takes an average of three attempts to inflict pain before someone will give up useful information, you know." "The Great Torch burns at a temperature 13 times hotter than the average fire." "There was a 21 percent chance that Dementia would get a new ruler." "There was only a 16 percent chance Thadon's heart would explode." "I heard the Fringe was attacked. I don't yet know exactly how many were lost, but I'll have to find out." "I understand there's a new Gatekeeper. Rebuilt much faster this time around, unless I'm mistaken. And I never am." "Good to see the armies back. Did you know that the average Saint is exactly six feet tall?" "I'm rather curious about this disappearance of Sheogorath's. Is he incorporeal, invisible, or has he moved to another plane?" "I lost track of the number of times I looked at the sky, waiting for the world to end." "So many figures to compile. Would that I had your infinite wisdom, Lord."